Show your love for Jazz, and it's preeminent station, with this stylish dark blue WKCR "Listen" T-Shirt. Size XXL. 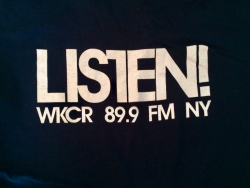 The shirt now qualifies as "Vintage," offering a WKCR logo of long ago but a message that remains just as poignant. The shirt is fashionable and a great way to spread the word.